Nighttime temps have dropped below freezing and daytime temps have been in the low 60's. Water temps are cold. Float tube with the big nasty streamers, like big ugly white/grey double bunnies and rabbit strip streamers but with slow retrieve and lots of stops. Both midging and streamer stripping techniques are working well. 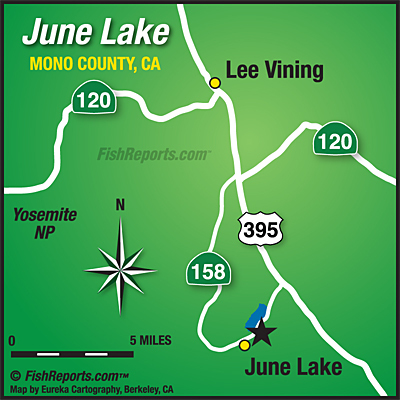 Try midging the outlet and inlet of Silver Lake and near the reeds on the far side of Gull and June. Nymphs: I would hang a #18 PT or the good ol' #18 black Zebra Midge under and indicator (like Crowley nymphing) from 2 feet under all the way to 10 feet down depending on where the fish are holding at the time. Keep adjusting depth. Try this on the inlet and outlet of Silver Lake. Streamers: White/ Grey or brown Double Bunny stripped slow and deep on Gull and June!! Leech patterns in brown, black and rust. Denny Rickards Seal Buggers in orange/green.